WIN with Pulsin and Smiggle! THIS COMPETITION HAS NOW CLOSED. THANK YOU ALL FOR ENTERING! In time for the start of term, we’re thrilled to be giving away a haul of delicious Pulsin Kids’ Fruity Oat Bars (7 boxes with 5 bars in a box), a Smiggle City Hardtop Lunch Box and Smiggle City Drink Up Bottle to one lucky winners – perfect for stylish and healthy back to school lunches. Pulsin and Smiggle are the perfect match for parents looking for healthy snacking alternatives and new cool ideas for lunchboxes. Did you know new Pulsin Kids’ Fruity Oat Bars contain a third less sugar than the average kids’ fruit snack? These brand new oat bars come in three tasty flavours: strawberry, blackcurrant & apple and orange choc chip. Created for children aged 3-9 years, the bars are made with real fruit and natural ingredients. The bars only contain natural sugars, and make up one of your five-a-day. What’s more, they are also made with a nut free recipe, are gluten, dairy and soya free with no artificial ingredients. The Australian stationery brand, Smiggle needs no introduction and is dedicated to creating original, fun and affordable stationery. 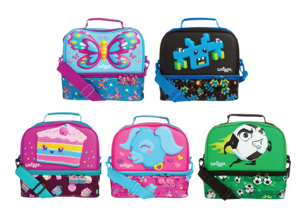 Whether back to school essentials are required or some stylish gadgets and gizmos to deck out desks or lockers, Smiggle always dreams big. The Smiggle City Hardtop Lunch Box comes with two large compartments of storage, carry handle, detachable carry strap, name and address label and super cool embossed and scented detailing. The lining is BPA free and food grade safe. 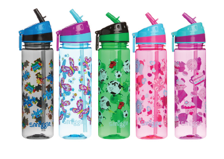 The flip-top spout drink bottle comes in cool designs and co-ordinates with a range of Smiggle school essentials you can mix & match! All you need to do to enter is follow the instructions below. Good luck!